Rachael Pazdan, who started her own concert promotion company called Hyponocraft, has been a fixture in the NYC music scene for a while. 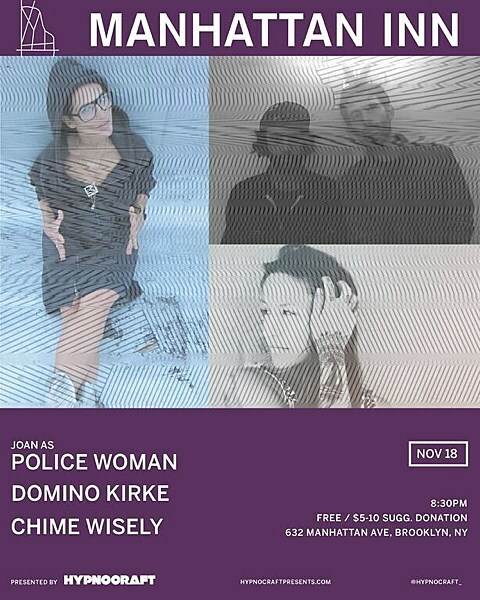 Her most notable endeavors include starting The Hum music series, which just wrapped up its October installment (check out pictures), and At The Inn (ditto). Both of those series took place at Brooklyn’s Manhattan Inn (632 Manhattan Ave), the same venue that Rachael has just been named the new booker of (or “talent buyer” as they say in the biz). 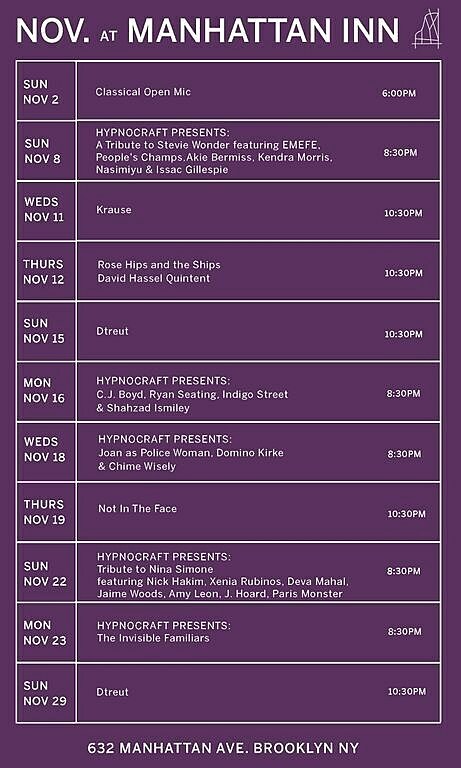 The Hypnocraft-presented shows begin this month, and it looks like she already has some cool stuff coming up. 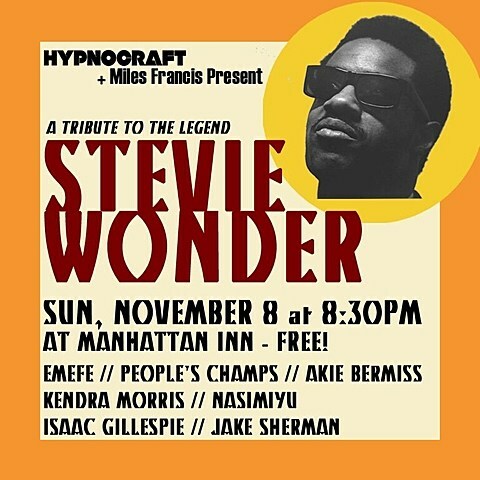 On Sunday (11/8) there’s a Stevie Wonder tribute with EMEFE, Kendra Morris and more; a show with Ryan Seaton, Indigo Street + Shahzad Ismaily and more on Nov 16; one with Joan As Police Woman on Nov 18; a Nina Simone tribute on Nov 22 with Nick Hakim, Xenia Rubinos and more; and an Invisible Familiars show on Nov 23 with Superhuman Happiness. 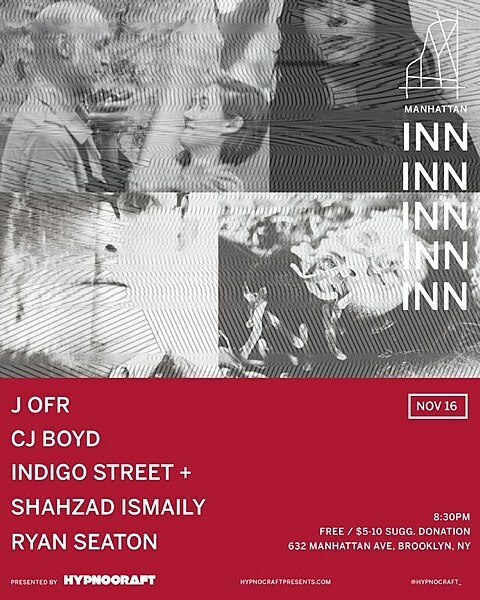 Show posters for the November calendar and most of those individual shows can be found below. 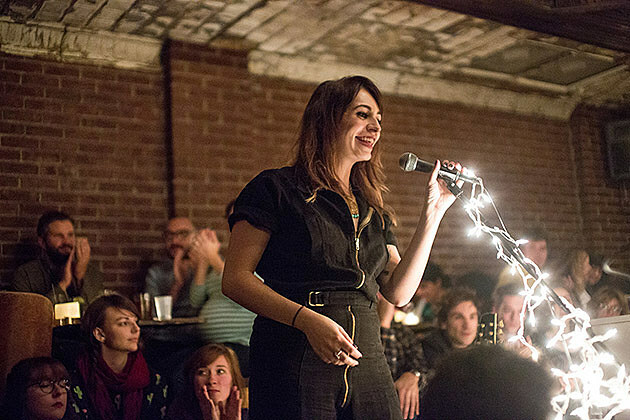 Rachael’s new position should continue to bring many talented women to Manhattan Inn, which was something ‘The Hum’ specifically focused on. As she told Brightest Young Things, “I started seeing concerts almost every night of the week and realized there was a huge gender gap in the live music scene. It was the reverse gender gap that existed in dance. As a woman, I think I was curious about that and why it existed. The more I thought about it, the more I wanted to see a night of all women musicians.” Mashable put out a mini-doc on The Hum this week. it talks about how it began and the impact it’s had. You can watch that below.